For over 140 years, the Marsh Instruments division of the Marsh Bellofram Group of Companies has manufactured the highest quality pressure gauges and thermometers for a variety of commercial and industrial applications. 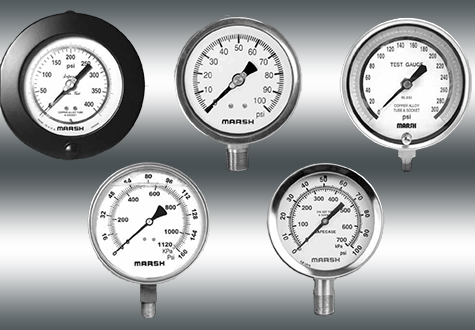 Marsh Instruments offers the Marshalltown Value Series as its most economical, general purpose gauge line. 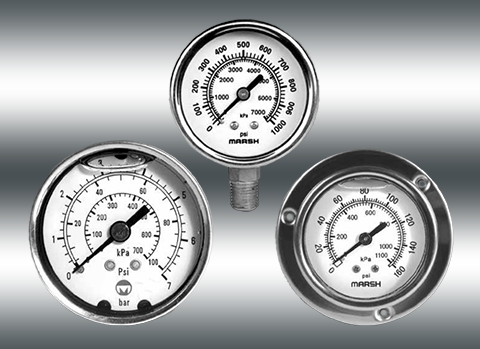 These gauges are designed for use with non-corrosive media including air, gas, and oil. 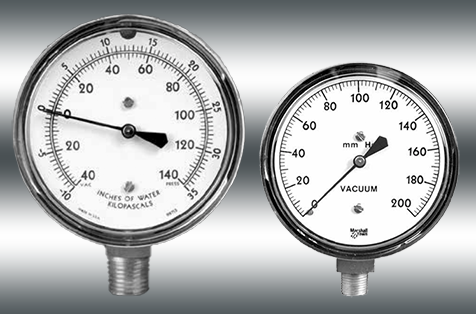 Typically, these gauges are used with boilers, compressors, dryers, FRLs, pumps, and other commercial and industrial applications. 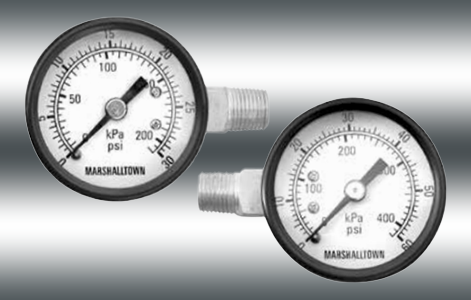 Case sizes: 1-1/2" and 2"
For more information about these gauges, see the Marshalltown Value Series Gauge Datasheet launch and contact us to start your order. 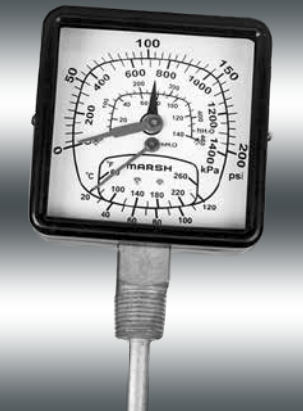 Marsh Instruments general service gauges are general purpose, economical gauges for use with non-corrosive media, including air, gas, oil, and water. They are typically used in boiler, compressor, dryer, pump, and various other commercial and industrial applications. Dial sizes: 1-1/2", 2", 2-1/2", 3-1/2" and 4-1/2"
For more information about these gauges, see the the General Service Steel Case Gauges Datasheet launch and contact us to start your order. 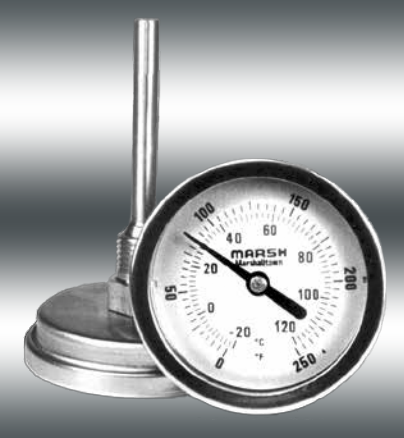 Marsh Instruments severe service gauges are designed to measure pressure in extreme industrial and OEM environmental conditions where pulsation and vibration pose a challenge. Typically, these gauges are used in chemical, marine, OEM, and oil and gas applications. Mountain Controls offers the following Marsh Instruments severe service gauges. For more information about each of the gauges, see the corresponding Datasheets linked in the tables below. Check out our online stock to order directly or contact us to start your order. 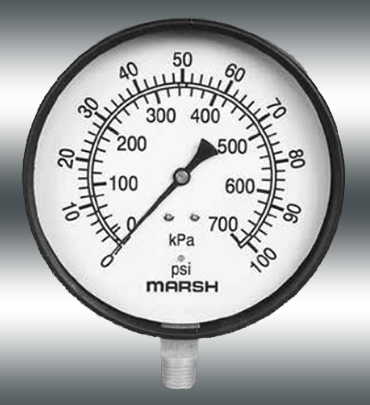 Marsh Instruments low pressure diaphragm gauges provide low pressure readings in a variety of applications including HVAC systems and low pressure gas burner systems. 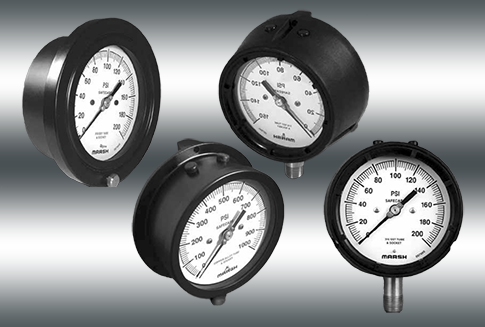 Dial sizes: 2-1/2", 3-1/2", and 4-1/2"
For more information about these gauges, see the Low Pressure Diaphragm Gauge Datasheet launch and contact us to start your order. Marsh Instruments precision service quality gauges provide great accuracy and continuity at an economical price. They are typically used in applications involving air compressors, reciprocating pumps, boilers, hydraulic presses, and many other industrial and OEM applications. Dial sizes: 3-1/2" and 4-1/2"
For more information, see Precision 100mm Gauges Datasheet launch and Precision Service Quality Gauges Datasheet launch, and contact us to start your order. Marsh Instruments offers a comprehensive line of process gauges featuring safecase design, dry or liquid fill medium, and a variety of options to fit a variety of needs. These gauges are typically used in chemical and petroleum chemical processes, compressors, power plants, and oil platforms. Dial sizes: 4-1/2" and 6"
For more information about these gauges, see the Process Gauge Datasheet launch and contact us to start your order. Marsh Instruments has a wide variety of reliable, cost-effective temperature instruments that are suitable for monitoring temperature fluctuations in industrial-grade applications including chemical processing, HVAC, OEM, offshore, oil and gas, power generation, and process control. Marsh Instruments bimetal thermometers provide reliable, cost-effective locally mounted temperature indication in 9 dual scale ranges (Celsius and Fahrenheit). These thermometers are typically used in chemical, HVAC, offshore, power, process, and OEM applications. Dial sizes: 2", 3", 5"
For more information about these thermometers, see the Bimetal Thermometers Datasheet launch and contact us to start your order. 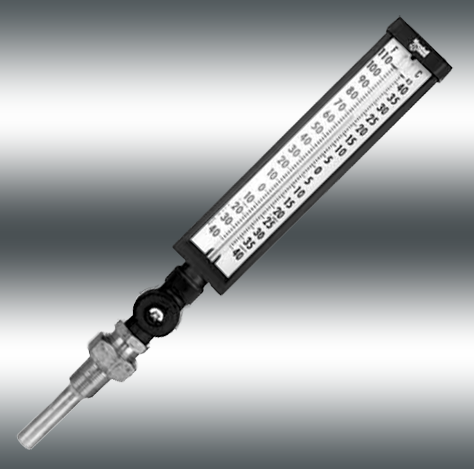 Marsh Instruments offers adjustable-angle, industrial thermometers designed for use in demanding commercial and industrial applications with limited space, such as condensers, diesel engines, pipelines, pumps, reduction gears, and steam turbines. 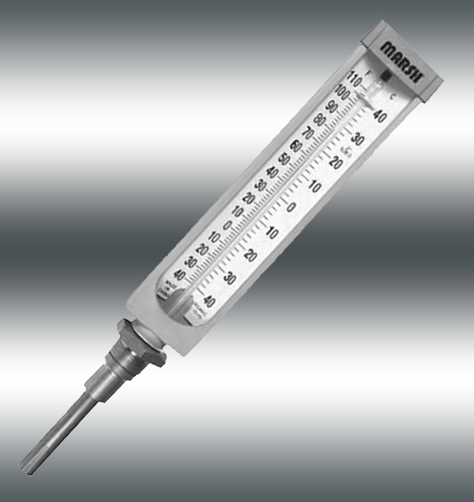 For more information about these thermometers, see the Industrial Thermometers Datasheet launch and contact us to start your order. Marsh Instruments offers high-accuracy submarine thermometers designed for space constrained applications such as diesel engines, steam turbines, reduction gears, pumps, condensers, boilers, chillers, and pipelines. For more information about these thermometers, see the Submarine Thermometers Datasheet launch and contact us to start your order. Marsh Instruments offers tridicators (also known as boiler gauges) for use with hot water heating applications such as hot water boilers, heated pools, and hot tubs. They indicate temperature in Fahrenheit and Celsius, and pressure in psi and altitude in feet of water. For more information about these thermometers, see the Tridicators Datasheet launch and contact us to start your order. Marsh Instruments has a variety of thermowells to protect temperature sensors from temperature extremes and to enable removal of an instrument from the process without requiring shut down. 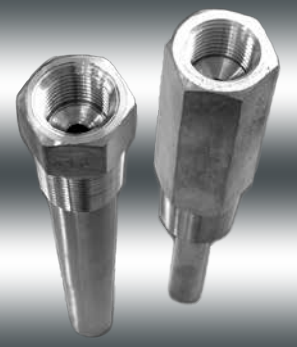 They offer a variety of threaded thermowells in brass, 304 stainless steel, or 316 stainless steel and are available in tapered or straight shanks. For more information, see the Thermowells Datasheet launch and contact us to start your order. Marsh Instruments offers a lightweight, portable, battery-operated, high accuracy digital pressure indicator to convert pressure input to an LCD digital readout. It is ideal for calibrating DP cells, I/Ps and P/Is. For more information, see the Marsh Instruments Handheld Digital Pressure Indicator and Calibrator Datasheet launch and contact us to start your order. The Marsh Bellofram Group of Companies offers BelGAS needle valves for use in instrumentation, process plants, oil and gas production, and other general applications that require isolation and positive shutoff. Mountain Controls offers the following BelGAS needle valves. For more information about each of the valves, see the BelGAS Needle Valves Datasheet launch and contact us to start your order.